The course aims at providing to the student the basic knowledge and analysis tools concerning the design of bridges, with particular reference to small to medium span bridges of simple typology. During the lectures, construction procedures and analysis methods of bridges are shown, including some criteria that guide the student to different design choices. As application, the student will carry out a simple design of a railway or road bridge under the guide of the instructor. Introduction. History of Bridges. 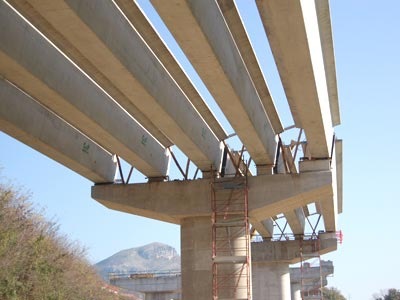 Classification of bridges by typology and material, Actions on road bridges, Actions on railway bridges, Main constructive elements of bridges, Decks: the distribution of loads, influence lines, Main typologies of decks, Local effects: verification of R.C. slabs, Local effects: verification of orthotropic plates, Local effects: Box girder decks, Distribution of transverse loads: Beam girder decks, Distribution of transverse loads: Box girder decks, Reinforced concrete and prestressed concrete decks: shrinkage and creep effects, Steel decks: fatigue, instability of plates, Construction methods of bridges, Piers and abutments, Bearings, Foundations, Seismic design of bridges, Seismic isolation. In addition to lectures, some class exercises are developed, during which the design of a simple bridge will be carried out by small groups of 2-3 students. The presentation and the discussion of the bridge design represents an essential part of the final examination. UNI ENV 1991-3: Eurocodice 1: Basi di calcolo ed azioni sulle strutture. Parte 3: Carichi da traffico sui ponti.